Situated north west of Naples, Campi Flegrei are one of the most interesting spots out of Naples city. In effect it's divided from Naples simply by the hill of Posillipo, and it's considered as part of the whole Naples bay, but within its own bay and craters and with other considerable peculiar signs that make it different from all the rest. 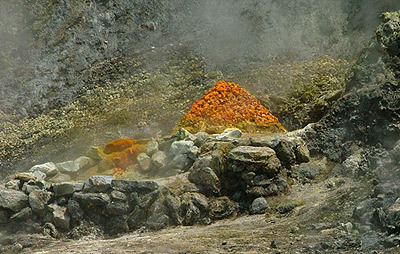 The last active crater of the Campi Flegrei is the Solfatara, where it's still possible to see some volcanic activityas gas emissions and gives an idea of how Campi Flegrei were in the past when volcanic activities were much more present in the area (crater of Agnano and Lake of Averno). Astroni's Crater is another dead crater with a wonderful vegetation that made it a hunting area for the Kings od Borboni Family. Today the reserve is under the protection and management of WWF. Monte Nuovo: the volcan which arose in only one night in 1538, is now a dead crater of 180 metres covered by a green vegetation and allows suggestive sights of the whole volcanic area of Campi Flegrei. Nowadays is naturalistic park.